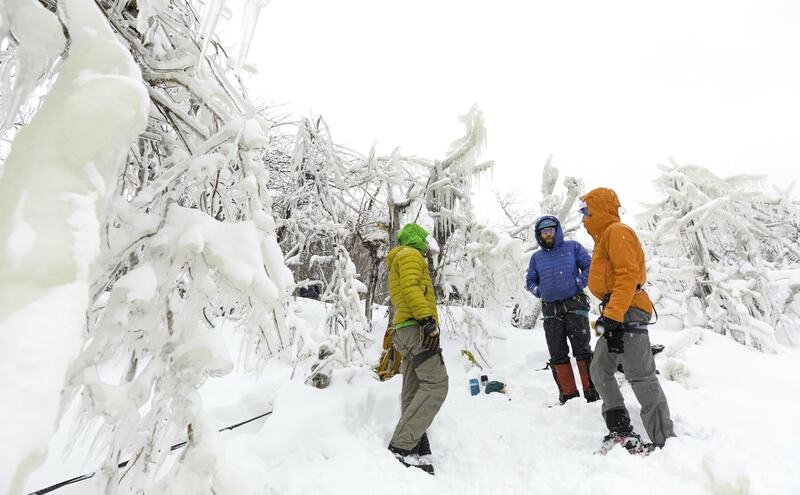 Climbing hundreds of feet up an ice column, with Lake Superior surging below, is not for everybody … but it is for these winter-hungry muchachos. 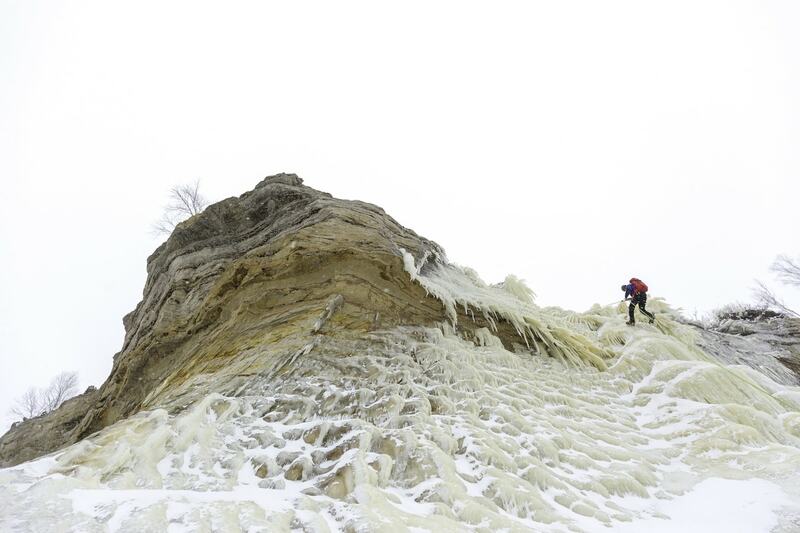 Traverse City photographer Erik Olsen takes us ice climbing in the Upper Peninsula. 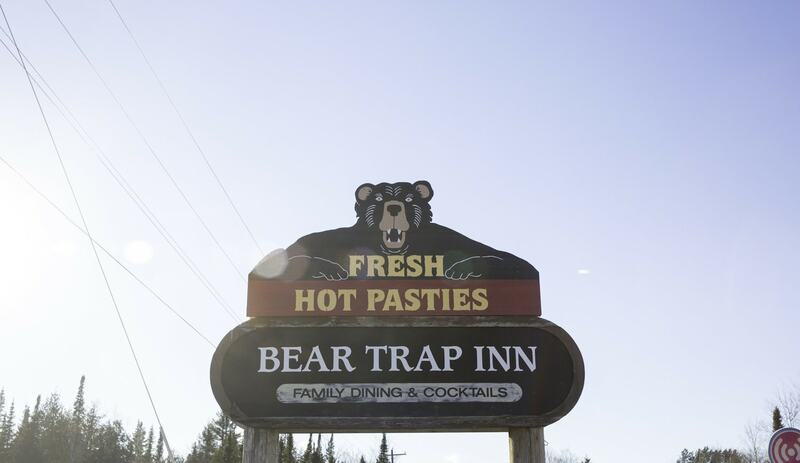 Get your copy of the January 2018 issue Traverse, Northern Michigan’s Magazine. A frosty and early start, a 15-mile ski, a giant slab of vertical ice that’s meant to be scaled. Some call it fun. confections usually take me to finer bakeries and restaurants. So frequent a visitor am I at Amical in downtown Traverse City, the friendly staff would draw open the glass lid to the confections upon seeing me walk through the door. Life is often about sacrifice, and this is why I find myself at a Holiday gas station in Munising at 6:30 in the morning. This gas station does makes a pretty mean chocolate chip macadamia nut cookie that pairs well with black coffee, making it a very sensible rendezvous point in the early morning. This is how traditions begin. It’s 14 below zero, and I should be in bed. However sleeping in when there is ice to be climbed is just a silly proposition. It’s so cold I hear the snow squeaking like Styrofoam under the tires of a lifted Tacoma pickup truck pulling in beside me. The rest of our crew is awake and have made the drive from Marquette on time! 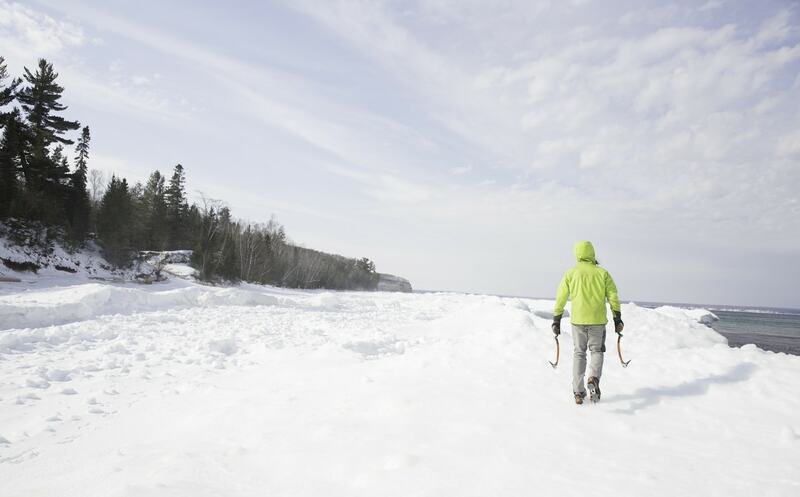 The wintertime Pictured Rocks National Lakeshore is drastically different in at least four ways from its summer self. One, there is not a single mosquito or black fly to be found. Two, it’s cold, not like in the summer “I will only swim for 10 minutes” cold, but bitter, “steal your breath and chill your bones” cold. Three, there are no fudgies. 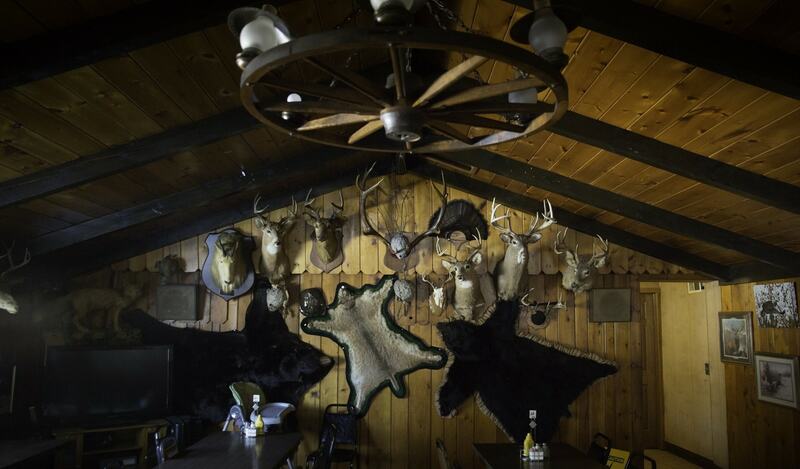 All the normal tourists have been replaced by slednecks in slightly smaller numbers. that is completely different about the lakeshore in the winter is access. Many of the roads into Pictured Rocks National Lakeshore are not maintained in winter. 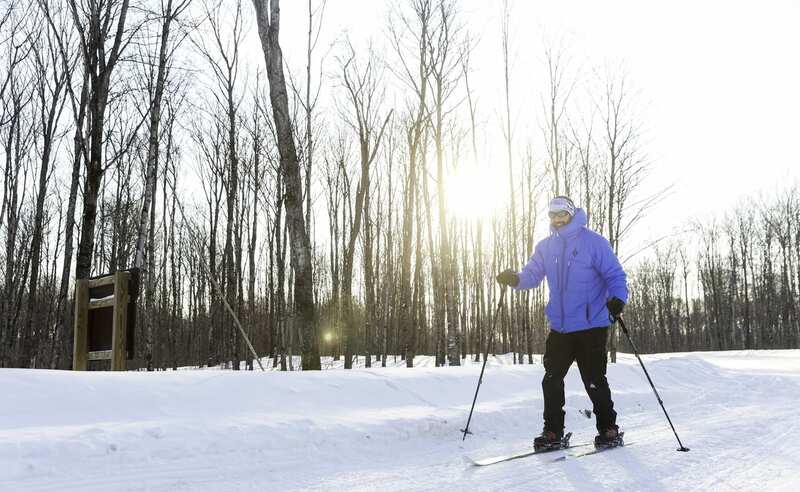 Snowmobiles are an option on the roads, but they aren’t allowed on the trails, so you’d better have some skis because it is human power alone that will get you where you want to be. But plowed road or no, we are going to see how far this lifted truck will take us! Squeezed three-wide in the front seat, we’re feeling an incredible amount of optimism. 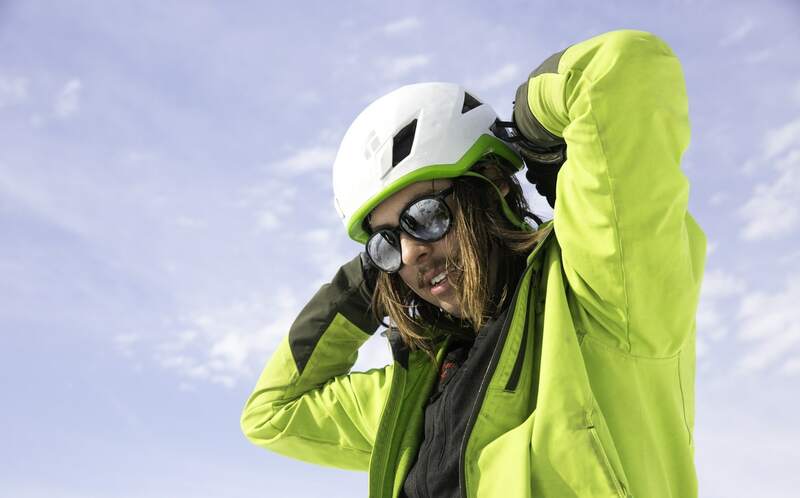 The snow ahead looks deep, but the want is strong and participants foolhardy. The cheering from the small chorus pushes our driver farther. We all know we are playing a desperate game that many have lost before. We think this truck can get us another mile down the unplowed road, just a little deeper into the Chapel Basin. The truck feels light and wanders back and forth but pushes on with serious determination. The cheering from the group abruptly halts when we all feel the truck sink suddenly and start to lurch. Open, steaming gas station cups spill coffee around the truck. This garnishes the sting of our demise with the scent of hazelnut. Our trusty wheelman finds reverse and is able to back up without trouble to the roar of another round of cheering. Once I remove that layer I should have left at the car, the ski to the lakeshore is fantastic. We are gliding into woods that often haven’t seen a person since the last climber came by; one of us could have been that climber. The trails in the park feel out there, they feel peaceful. There’s an added sense of remoteness bestowed by cold and snow. The sun starts to rise, casting long beams of light across the fresh layer of sparkling white. The sun brings with it warmth. My torso and legs are toasty from the exertion, but now the sun begins to warm my nose and fingers, too. After following the lakeshore trail, we arrive at the top of the day’s objective. It is a climb called HMR. 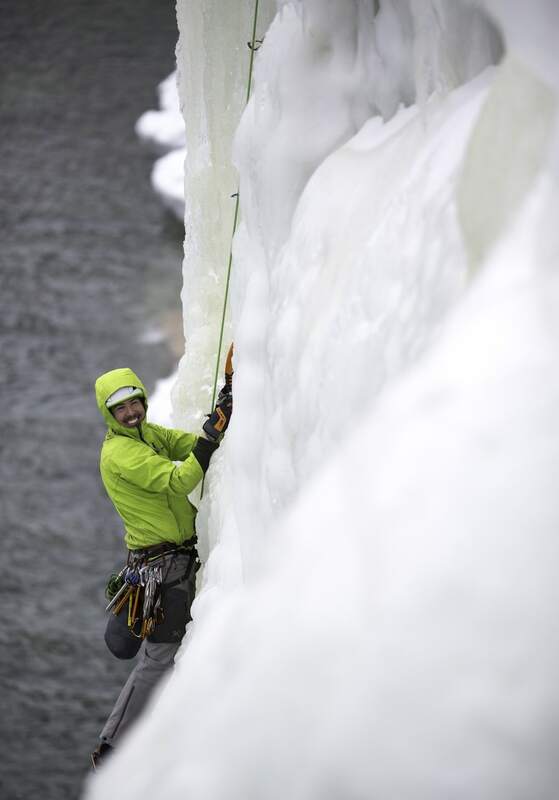 Ice climbing in the park can go a few different ways. 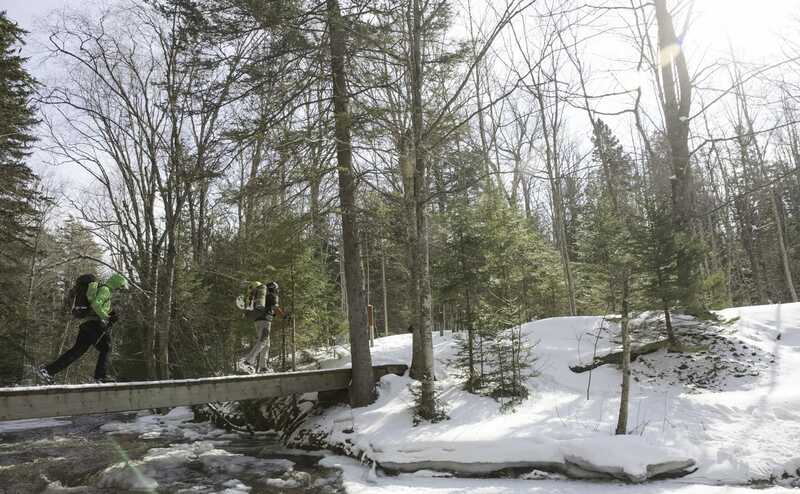 You can stick close to the town of Munising and do small hikes to smaller climbs, or you can get out in the backcountry, work your way to the lakeshore, and take your pick of hundreds more challenging climbs. 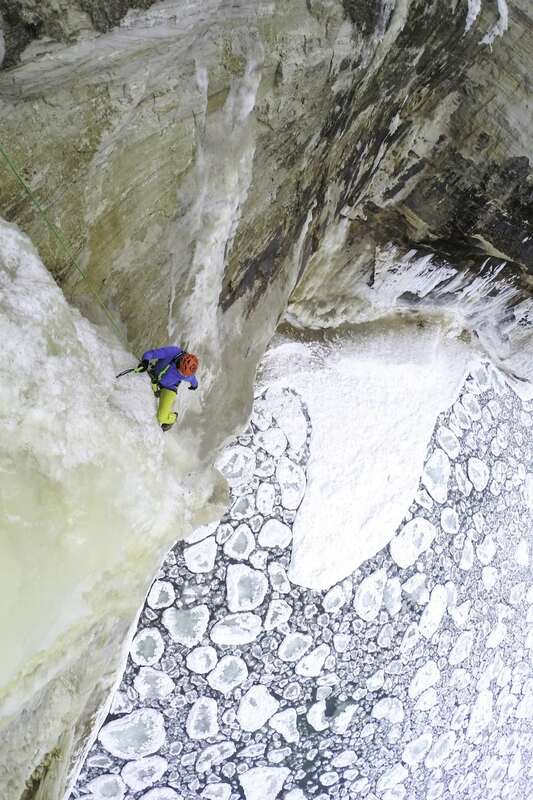 Until the lake ice freezes (if it does), the only way to access these climbs is from above. 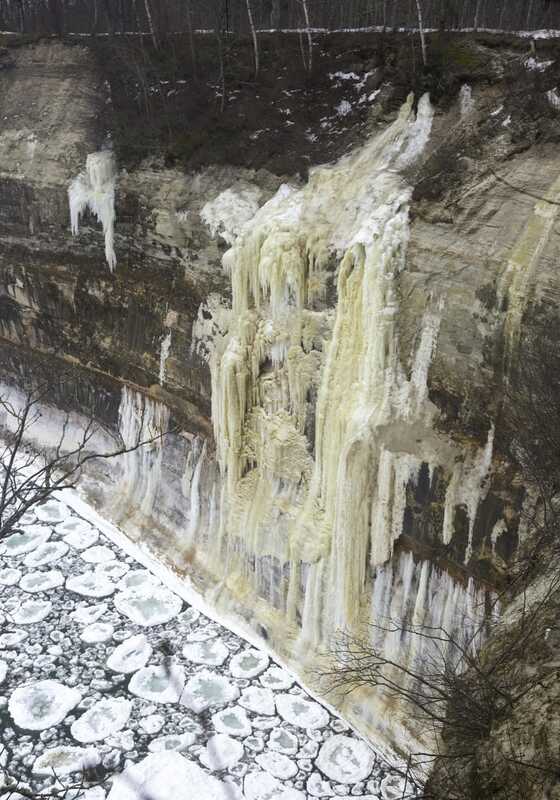 The massive ice forms we climb grow from small seeps that ooze from the face of the sandstone cliffs and from tiny streams that spill over the top, streams you can easily miss, buried, as they are, under feet of snow. Typically you cannot even see the climbs from above. 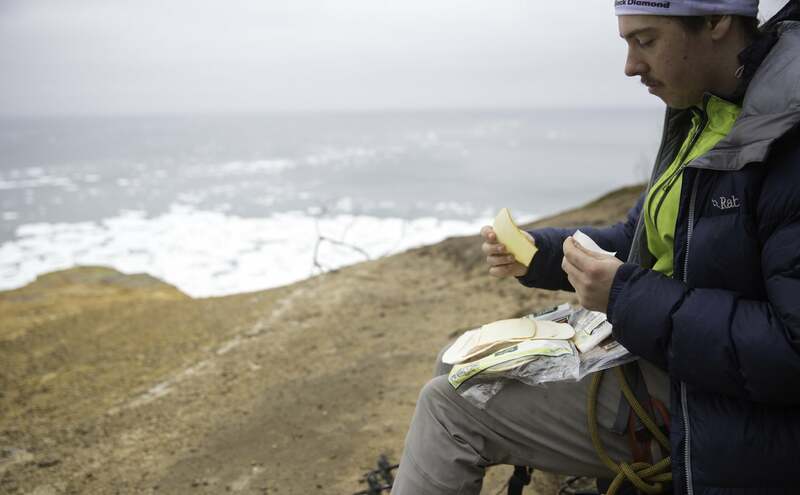 We lay our gear and stash snacks in our pockets. One by one we secure ourselves to the rope and walk over the cliff edge, the first climber takes a long pause to check the climb, the res of us check our nerves. Rappelling down the rope with care hopefully lands us on a nice place to stand, some sort of ice shelf, hopefully out of reach of waves. 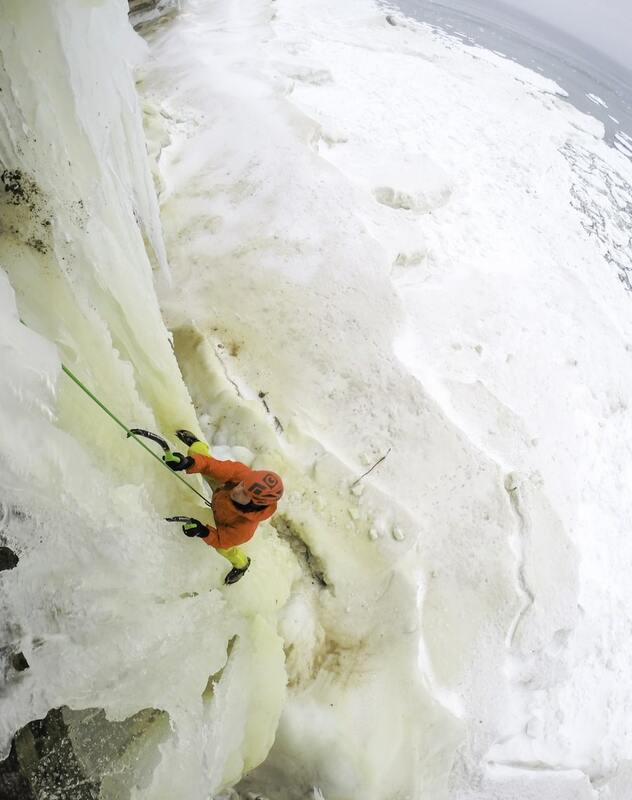 We attach ourselves to this column of ice using specialty screws and then pull down our ropes so we can anchor it to the ice as one of the leads to climb. Climb or swim are now the only choices we have, and staying out of the water is a pretty good motivator. The first climber ties in while the belayer prepares to pay out rope. The similarities between rock and ice climbing end there. 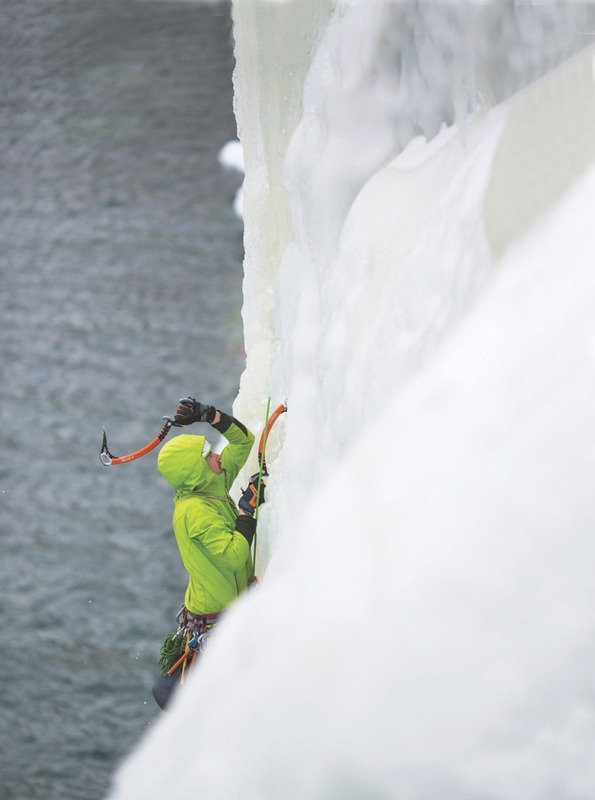 Even if the climbing style was the same, on the lakeshore you have thunderous waves crashing, reverberating up the entire ice column, you feel your way along the surface using tools—ice axe in hands, steel crampons on boots—instead of fingers and toes, which makes your placements precarious. The surface itself is not always as defined as rock, with hollow voids and chandeliers, the ice presents challenges in all three dimensions and is often hard to predict. Might I add that we are trying to climb 200 feet vertically, in the cold, with arms over our head. Hanging off the side of a cliff can be thrilling for most, but factor in having to perform athletic feats and it creates a wonderfully challenging activity. The ice formations are beautiful, and we are surrounded by a winter wonderland. With ice tools out, we drive axe heads in one by one, with an eruption of ice chips. We kick to puncture the ice face with the steel teeth of the crampons, and ascend. After a successful climb we celebrate by sharing pocket snacks and a Thermos full of gas-station coffee. We climb several routes, but only a few times each before haste must be made. It is still a long ski back to the truck that we hope isn’t stuck. The ski out is much less enjoyable than the ski in. We are tired from our morning ski, we gave everything we had left to the climbing, and now we need to slog all of the gear out; did I mention that the route goes uphill leaving the lakeshore. Rounding the last bend into the Chapel area parking lot—the parking lot we could not even get close to because of the unplowed road—we watch the sun disappear. Arriving into the parking lot we feel the cold starting to creep back into weary bones. We feel like it’s the last straw, so in desperation I pull off a glove and plunge a hand into the snowbank, and to the amazement of my comrades pull out a Red Bull, stashed in secret for every member of the party. We are not done yet, but now we have wings for the last half of the ski, starting with a long, steady hill out of the parking area. The Red Bull loses effect after a couple miles. For the last mile we are trying not to think about how much we want out of these boots, how much our bodies ache, how we should just leave the pack for next time. 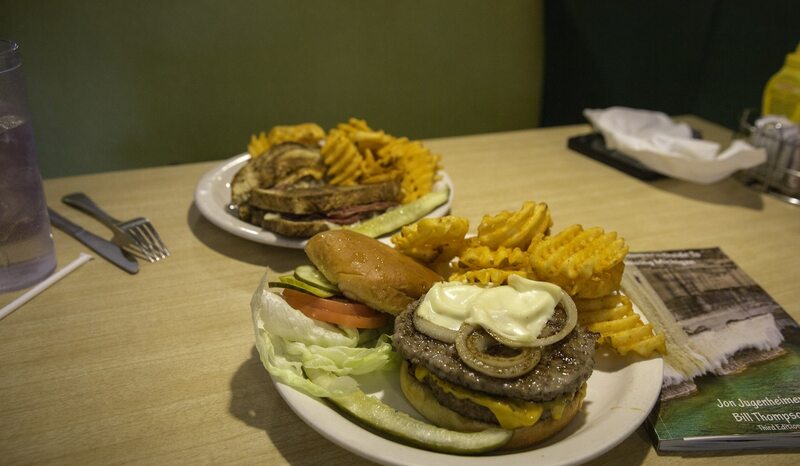 Instead we try to focus on the one thing that will inevitably save us tonight: the Michigan Wisconsin burger. The Bear Trap tavern is the only restaurant that can administer the cure of a cholesterol-filled belly brick such as this, and it’s the only thing that can fix our condition now. I can taste the Two Hearted microbrew that is going to wash the lipids off the roof of my mouth after each bite. Shocked, I feel my pace increase as if possessed by my body’s necessity for bratwurst patties and all the fixin’s! I finally stop staring at my feet long enough to realize I have been moving, and just ahead is the last corner before the truck. Practically sprinting, we all reach the vehicle at once, falling all around like a photo finish at the Boston Marathon. Packed up, the truck starts and moves like a tractor puttering along through the snow. I love this truck! This trusty steed delivers us to the Bear Trap. As we walk in, we are greeted by familiar faces, people who can tell from our condition that they don’t need to ask us what we want to order. It’s good to have traditions.